One of the main reasons we remove skin tags is for aesthetics. It would be a shame to remove the skin tag, only to find a more permanent skin tag scar in its place. Whether a scar will remain depends on the method used to remove the skin tag, your skin type, the size of the skin tag and whether you take good care of your skin once the tag has been removed. Skin tags are attached to the skin by a thin stalk. In some cases, when the skin tag is larger, the stalk, or peduncle, can be thicker. A skin tag that has not been thrombosed or frozen is still live tissue. Removing the skin tag may result in the skin breaking and leaving a possible scab or scar. In some cases, it is just a small scab that will appear when a skin tag is removed. Some people pick at the scar and pull it off prematurely. A scab’s job is to heal the skin underneath it. Picking off a scab, rather than waiting for it to fall off naturally, will often result in a scar. Different methods of removal have different healing times and results. Cautery is using a heat tipped instrument to burn off a skin tag and seal the skin to avoid further bleeding. The skin tag comes off right away and the area where the skin tag used to be, may be a bit red for a while, but this will fade. In some cases, it may leave a small scab. Leave the scab and let it fall off naturally to avoid a scar. Using liquid nitrogen to remove a skin tag by flash freezing it is a popular method of removal. Once the skin tag has been frozen, it won’t fall off right away, but it may start to change color immediately, signaling that the blood flow has been cut off. There may also be slight blistering around the skin tag as this area may have gotten a little frozen too. This will heal quickly and in a couple of days, the skin tag should fall off, leaving little to no scarring. When a doctor surgically removes a skin tag, he is cutting it right off from live tissue. Sometimes it may bleed a little and if they are larger skin tags, the doctor may cauterize the area to avoid any major bleeding. Once the doctor cuts off the skin tag, it is immediately removed and a small scab may start to form. Because the skin tag was cut off live, it may leave a small scar, especially if a scab formed and you pick it off prematurely. The doctor will usually apply some antibiotic cream and cover it with a small band-aid. Ligating a skin tag is cutting off the blood supply to it by tying it off at the base. You can do this either with a piece of string or dental floss or using TagBands. This method works by killing the skin tag first and allowing it to fall off on its own. 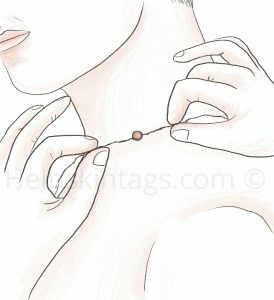 After placing the band or string, the skin tag will usually take 4 – 7 days to fall off. In this time it will change color, usually turning brown or black. Once the skin tag is gone, no scar or scab should remain as tissue in the peduncle would be dead tissue. Most OTC (Over The Counter) creams work by peeling away the layers of the skin tag and suffocating it. The skin tag dies before it falls off. This method is non-evasive and by the time the skin tag falls off, your skin should have healed and no scarring should remain. Most methods of removing a skin tag aim to leave little to no scarring. The possibility of scarring occurring can depend on your skin and the size of the skin tag. Using a method that cuts off the blood supply to the skin tag such as ligation, freezing or an OTC cream, will leave the least scarring as the live skin isn’t getting cut. Whichever method you use, if there is any scab remaining, be sure not to pick at it. Any scar that remains will usually be small and with proper care can disappear over time. There is a range of different products available to help remove scarring. You want a product that promotes good skin health and helps new skin cells regenerate to cover where the scar has formed. Creams or oils that contain high vitamin E help the skin heal quickly. Apply it twice a day and you will eventually see your small scar fading. Tea Tree Oil is also an excellent product to apply after removing a skin tag. It’s antibiotic and antimicrobial properties help keep the area clean and it also works to reduce scarring.